Deposito de seguridad con el valor de la primer noche. Consultar habitaciones y cupos disponibles antes de reservar. 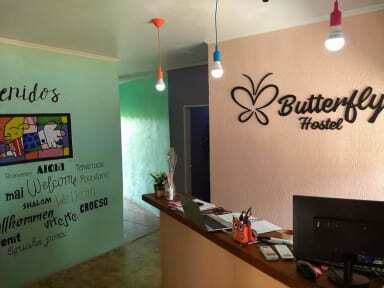 Butterfly Hostel in Puerto Iguazú features an outdoor swimming pool and barbecue facilities. 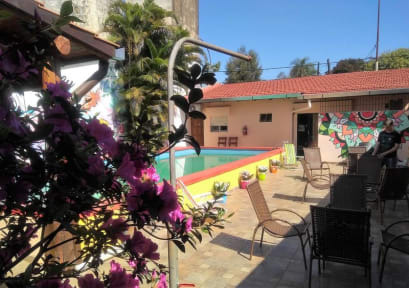 Featuring a garden,A continental breakfast is available each morning at the hostel.Free WiFi is accessible to all guests.Speaking English and Spanish, staff will be happy to provide guests with practical advice on the area. The property is located 2 km from Shopping Mall and 1.5 km from Selva Viva Park.The nearest airport is Cataratas del Iguazu International Airport, 18 km from the property. Orchid Area is 1.7 km from Butterfly Hostel. Featuring Double Room,triple room and 6-bed Dorm, 8-bed mixed Dorm and 6-bed female Dorm.The rooms have climate control and a safe for guests' convenience. Guests can find shared bathrooms. Check out from 00:00 to 10:00 .